Ms. Paredes glances at her watch. Today, the principal will visit the class for the first time this year. As she settles the children on the carpet for a read aloud using How Many Stars in the Sky?, by Lenny Hort, Principal Murin walks in and takes his seat. The story ends and the children discuss their favorite parts with a partner. Then Ms. Paredes and her assistant begin a “Twinkle, Twinkle, Little Star” fingerplay. After that, children choose their learning centers, and Ms. Paredes circulates. Principal Murin observes her in the science center. Two girls and a boy take an empty box and imagine that they are in a rocket ship going to the moon. Ms. Paredes asks encouraging questions like, “Where else could you go in space?” and “How will you stay seated in the rocket with no gravity?” Ms. Paredes is excited to see the children’s engagement and to hear them think about answers to the questions. When the observation period ends, though, Principal Murin leaves the classroom confused. He appreciated the children’s engagement with the science center but wonders why such a structured lesson ended up with the children “just” playing. This scenario is all too common. Elementary school principals don’t always recognize how much children learn through play. In fact, play is a vehicle for student-centered learning, allowing meaningful interactions and conversation. Guided play helps children learn to solve problems, persist through challenges, build vocabulary skills, and gain background knowledge in many content areas. Many studies show the value of play-based learning. Yet it is far too rare in the early grades. We authors work at New America, a DC think tank. Last year, our Early and Elementary Education Policy team convened five focus groups of elementary school principals around the country to explore their perceptions of what instruction should look like in pre-K through third grade classrooms. The groups answered questions on staffing, student transition from pre-K to kindergarten, student assessment, professional development, and the role of a principal. We compiled our findings into a series of briefs called Principal’s Corner: Perspectives on Teaching and Learning Pre-K–3rd Grade. Play is essential to child development. When principals and other instructional leaders are able to see what learning through play looks like in a classroom, they are better equipped to help teachers promote developmentally-informed practices. To be strong early education leaders, principals need better preparation, professional development, and support from districts and states. Some states and districts around the country are stepping up. Illinois, for example, is reaching principals before they start leading schools. The state has recently revamped its licensure system, replacing the K–12 principal license with a P–12 license. Early childhood content is now woven through the curriculum so that all aspiring principals receive preparation in pre-K. Illinois is currently the only state that requires principals to have early childhood education preparation before leading an elementary school. 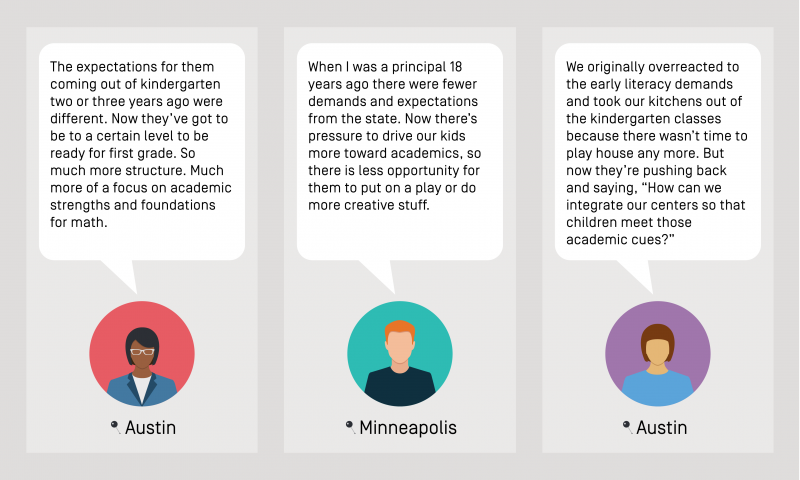 Minnesota is one of a handful of states teaching principals about the importance of early education through in-service professional learning. This method reaches novice and experienced principals who are already leading schools. The state’s Department of Education worked closely with the Minnesota Elementary School Principals Association on a Principal Leadership Series, which is helping demonstrate how to build strong pre-K–3rd grade programs in schools and communities. States can take less formal approaches to familiarize principals with key elements of high-quality early education. Colorado is one of several states that has created resources to assist principals in evaluating early education teachers. Teacher evaluation has become one of the most important aspects of a principal’s job but, as shown in our opening vignette, there is often a disconnect between what teachers and their principals view as good teaching. In response to requests from both teachers and evaluators, the Colorado Department of Education worked with a group of early childhood educators to create Practical Ideas for Evaluating Early Childhood Educators, a handbook to help evaluators apply the state’s general evaluation tool to the early grades that includes specific and detailed examples. Improving principals’ understanding of early learning can come from the top. Superintendent Steve Oats from Winston Salem, North Carolina, is often held up as an example of a superintendent who understands the value of play to children’s learning. Eva Phillips, coauthor of NAEYC’s book Basics of Developmentally Appropriate Practice: An Introduction for Teachers of Kindergartners, used the NAEYC DAP books as the basis for the professional development she provided to teachers in Oats’s district. In the Institute of Medicine and National Research Council’s Transforming the Workforce For Children Birth Through Age 8 report from 2015, experts encourage all states to revisit their policies and standards for education leadership to ensure that they incorporate the early elementary years. It’s reassuring to see states like Illinois, Minnesota, and Colorado acknowledging the importance of high-quality teaching and learning in the early grades. We hope other states to learn from these examples and build on their own work to strengthen principal preparation and professional development systems to make sure elementary school principals are more strongly grounded in early childhood education. With this expertise, school leaders like Principal Murin will be able to see that children engaging in dramatic play with a cardboard rocket ship really are reaching for the stars. Nell, M.L., W.F. Drew, & D.E. Bush. 2013. From Play to Practice: Connecting Teachers' Play to Children's Learning. Washington, DC: NAEYC. Bohart, H., K. Charner, & D. Koralek. 2015. Spotlight on Young Children: Exploring Play. Washington, DC: NAEYC. Shayna Cook is Policy Analyst, Education Policy Program at New America. Abbie Lieberman is Policy Analyst, Education Policy Program at New America.